• Local ID type — From the drop-down list, choose the identity type that is presented to the remote system. • Remote ID type — From the drop-down list, select the ID type the remote gateway is expected to present. • Authenticate by — From the drop-down list, choose the authentication method. 6. If additional settings are required, click theAdvanced button. The Advanced options section is displayed. • Authentication type — From the drop-down list, choose the authentication method. This setting must be the same on both tunnel specifications of two connecting gateways. • Phase 1 cryptographic algo — From the drop-down list, select the encryption algorithm to use in the first phase when establishing the VPN connection. This setting must be the same on both tunnel specifications of two connecting gateways. • Phase 1 hash algo — From the drop-down list, select the hashing algorithm to use in the first phases when establishing the VPN connection. This setting must be the same on both tunnel specifications of two connecting gateways. • Phase 2 cryptographic algo — From the drop-down list, select the encryption algorithm to use in the second phase when establishing the VPN connection. This setting must be the same on both tunnel specifications of two connecting gateways. • Phase 2 hash algo — From the drop-down list, select the hashing algorithm to use in the second phase when establishing the VPN connection. This setting must be the same on both tunnel specifications of two connecting gateways. The default value of 60 minutes is recommended. 8. Click Add. The IPSec Tunnel will now be displayed in the Current tunnels section. Edit IPSec Tunnel settings In the Current tunnels section, for the required IPSec Tunnel configuration, select the Mark option and click Edit. The selected IPSec Tunnel setting are made available for updating. Remove a IPSec Tunnel configuration In the Current tunnels section, for the required IPSec Tunnel configuration, select the Mark option and click Remove. The selected IPSec Tunnel configuration is deleted. Note: Many parameters used can be left at their default values when creating an IPSec site-to-site VPN tunnel Smoothwall to Smoothwall connections. a. Export the Certificate Authority certificate, and the remote host’s certificate from the primary host — see Exporting the Certificate Authority Certificate, and Exporting Certificates. b. From the remote host, import the Certificate Authority certificate exported in step 'a'. For a detailed description of how to import certificates, see Importing Another Certificate Authority's Certificate. c. From the remote host, import and install the Smoothwall’s certificate exported in step 'a'. For a detailed description of how to import Certificate Authorities, see Importing a Certificate. 2. From the remote host, create a tunnel using the same settings as configured on the primary Smoothwall. If the remote host is another Smoothwall system, repeat steps 4 to 7 shown in the section Creating an IPsec Tunnel, but on the remote host. 3. Initiate the connection from the remote host. If the remote host is a Smoothwall system, go to Network > VPN > Control, else skip to step 6. 4. From the IPSec subnets panel, locate and highlight the relevant VPN. 5. Click Up. The tunnel is initiated. 6. Ensure appropriate zone bridging rules are configured and active in order to allow traffic to and from the VPN tunnel. For more information, see Using the Smoothwall Firewall. Create certificates for the local and remote systems using Host and Domain Name as the ID type, for information about how to do this, see Managing Certificates . Install the local certificate as the default local certificate on the local system, for information about how to do this, see Importing a Certificate. Export the Certificate Authority certificate in PEM format, for information about how to do this, see Exporting Certificates. Export the remote certificate in the PKCS#12 container format, for information about how to do this, see Exporting in the PKCS#12 Format. Import and install the certificate as the default local certificate on the remote system, for information about how to do this, see Importing a Certificate. Click Add. All advanced settings can be safely left at their defaults. On the primary system, go to the Network > VPN > Control page. In the Manual control region, identify the current status of the VPN system. If the status is Running, you do not need to do anything. If the status is Stopped, click Restart. On the secondary system, go to the Network > VPN > Control page. In the IPSec subnets region, identify the tunnel that was just created and click its Up button to initiate the connection and bring the tunnel up. Note: In order to permit or deny inbound and outbound access to a site to site VPN tunnel, ensure that appropriate zone bridging rules are configured. 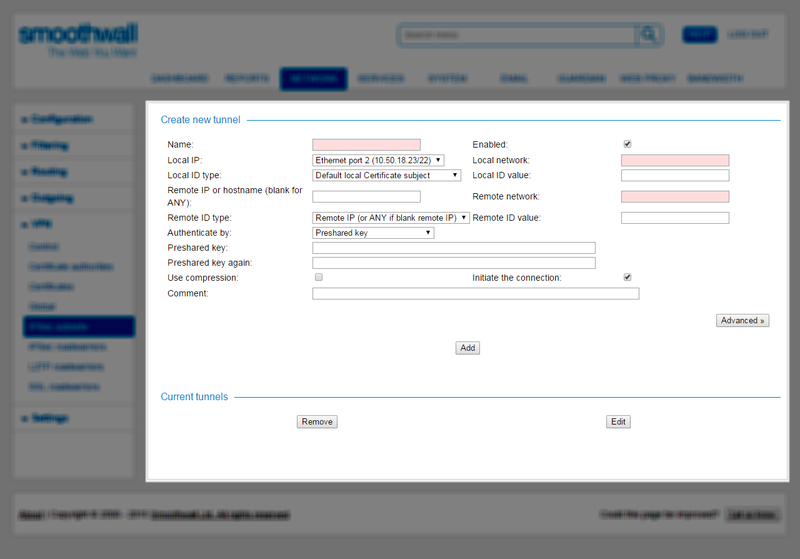 For further information, see Using the Smoothwall Firewall. Click Add. All advanced settings can be safely left at their defaults. The Smoothwall lists it in the Current tunnels area. The next step is to create a matching tunnel specification on the remote system.